An Earth-like atmosphere may not survive Proxima b's orbit Proxima B -- the nearest known exoplanet to our solar system is probably a dead world despite being in the habitable zone of its host star Proxima Centauri. Any Earth sized world would most likely be unable to hold onto an atmosphere -- leaving its surface exposed to harmful stellar radiation and reducing its potential for habitability. *New clues in determining the size of a black hole Astronomers have discovered what could be an easy way to determine the size of a spiral galaxy’s supermassive black hole. They’ve found a direct relationship between the geometry of some types of spiral galaxies and the hidden super massive black hole at their centres. *Calm seas on Titan could mean smooth landing for future space probes Astronomers have determined that the lakes and seas on the Saturnian moon Titan have few waves higher than a centimetre. The findings mean the giant moon probably has little wind – the primary driving force for waves on the oceans of Earth. *Huge storm on Neptune Astronomers have detected a massive storm as big as the Earth on the distant planet Neptune. This massive 9000 kilometer wide storm system was found in Neptune’s equatorial region – a zone where no bright clouds have ever been seen before. *Skywatching on the road The neat little portable telescopes you can take with you when you’re travelling. *The Science Report Loneliness and social isolation poses a greater public health hazard than obesity Man-made climate change to cause 60,000 deaths globally in the year 2030 People who survive a stroke without early complications have increased risk of death, another stroke or heart attack for at least 5 years, Two remarkably different animal communities around two relatively nearby hydrothermal deep sea vents Humans can identify emotions in the voices of all air-breathing vertebrates. Subscribe, rate and review SpaceTime at all good podcasting apps…including iTunes, audioBoom, Stitcher, Pocketcasts, Podbean, Radio Public, Tunein Radio, google play, etc. 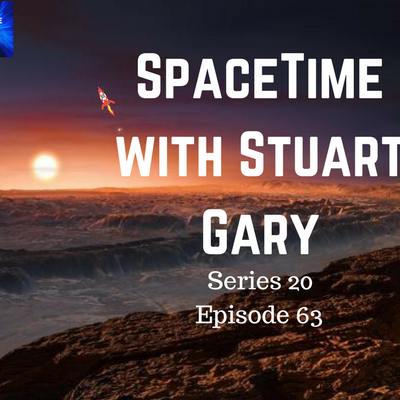 Help support SpaceTime : The SpaceTime with Stuart Gary merchandise shop. Get your T-Shirts, Coffee Cups, badges, tote bag + more and help support the show. Check out the range: http://www.cafepress.com/spacetime Thank you. Commercial music bed is thanks to Stefan Katenberg - 'The Drilling Begins'.